Ten bucks for a great tuner! I looked into and tried clip on tuners like the Snark. It worked well but I saw reviews that suggested some finishes were marred by the clip on over time. I saw the Peterson website and pondered on which tuner would work best for me with classical and steel string guitars. Then I saw the iStroboSoft tuner. Fascinated, I purchased and used the tuner with my iPhone and iPad. It has become my tuner of choice. I really like how it handles the job of fine tuning my guitars. I tried the sweeteners but finally I settled on the normal setting and use the “cents” setting. I find on most of my guitars the intonation on the third string is a bit finicky . If you just recognize this, you can kind of view the tuning bars and cent values to create your own “ visual” sweetener values. Bottom line- get it if you are in a quiet setting to use it. I actually think there is a clip for this that allows tuning in noisy environments? For me, I like playing at the end of day when all is peaceful and quiet. This tuner is the first step in practicing every day. Great software!!! Great app- period. I bought this tuner primarily for intonation my instruments. I also bought the jack to plug a 1/4” instrument cable into. The large display on my iPad is perfect for the bench and makes dialing in tuning easy. I also tune with the iPad mic when practicing (no other instruments interfering with the input). Yes, it’s worth every penny. I used to use iStroboSoft back in the day on my iPhone 3G when I played a beat-up, bootleg Strat — pleasantly surprised to run into it on the AppStore today and glad to see it’s just as good as it was then. Better than the other tuners on the AppStore (I’ve tried them all). Absolutely worth ten bucks: your guitar - and the ears of your listeners - will thank you. This app is probably my favorite app. I use this tuner often. It is extremely accurate and easy to use. After I purchased the app my iPhone died and I was happy to see it was restored through the Cloud when I purchased another phone. This truly is a great tuner. The last software tuner you’ll ever need. Been using this app for about 5 years now and no app comes close to the tuning accuracy of this one. I’m a session musician (bass, guitar, piano) and an educator and I use this app almost daily. I also setup and repair bass guitars and use it to intonate strings which requires very precise tuning and the tuner handles it superbly. Peterson also sells an adaptor to plug in guitars to your phone/tablet; when I’m on stage I use the tuner out of my amp into my phone and it works perfectly. The only feature I’d love to see implemented is an Apple Watch app. It doesn’t need to have the strobe screen but just the note and cents would suffice. I tend to lose faith in a developer that doesn’t test all functionality before release. There is a flaw with the in app purchase for extended ranges. iTunes is working just fine for other apps and music and some of the in app purchases, but not for extended range. Is it really that hard to test functionality before release? It causes me to wonder what else wasn’t tested. Low and high ranges with the app don’t work. Keep your handheld tuners! Simply put, if you want an accurate tuner in your pocket everywhere you go, this is the right buy. I’ve been tuning with harmonics for 40 years. Then I saw a video on YouTube showing clearly that harmonics are not correct, at least the fifth and seventh fret. I used this Peterson tuner to set my bridge intonation and tune my guitar and now it plays like a completely different instrument, this is a guitar I’ve been playing for 30 years. I feel like an idiot. BEST TUNER, Just GET IT! Finnally a tuner that does not flash and jump around and leave you gussing. So easy to slow down the strobe. Makes so much sense to pluck a string and let it resonate while the string is tuned. Very sensitive using my iPad Pro. Having cents show is a great feedback that further increases confidence. I've found the string's tuning jumps a few cents after letting go of the tuner. Easy to get use to and anticipate so you end up with tuining within fractions of cents. Also, never made sense to bang away at the string to keep the volume loud enough for my old clip on, or in line tuners. Not using a pick was a piece of information that didn't jump out at me. My local luther had made a comment that my guitar was tuned sharp. I had tuned my brand new guitar with a pick before heading to the luther. Update for the HD version? Are you planning an update for the HD version? I have been a luthier for 30 years and have been using my Stroboconn for that long. I wanted something equivalent and portable. I wrote my first spectrum analyzer (FFT) for hardware I made in 1984 running on a Mac+. I have a lot of expectations when it comes to this software. With in app purchases I had to spend $30 to replace the mechanical strobe which seems expensive for an app. It does, however, function very well. Make sure to calibrate it. I also spent an extra $10 for having the spectrum features replacing my Mac+. (Well worth it.) I would really like a power meter feature. Beyond tuning I often need to measure string to string balance in piezo pickups. The other feature I would love to have is a waterfall display of the spectrum. It would be an easy add. Wanted a tuner to set intonation. Did it by ear and was pretty close. But was still off a bit and wasn’t happy. (Guitars need a well tempered tuning.) The iStroboSoft with guitar sweetener showed me where I was off and needed to be, within 1cent. Also a great tool to have when trying out a new guitar. Tuner fits nicely in the pocket. I find that the room needs to be really quiet to do it right. For $16 with the sweetener it’s pretty good. Thanks for reading my review. Update: I found that setting the intonation with the sweetener on actually made the intonation come out wrong. I couldn’t find a way to shut it off so I set the intonation with my old boss tuner, then open tuned with the strobe sweetener on. That works much better. I have pedal tuners on my big and small boards. They are the ok but was frustrated that often had trouble dialing in-tune that pleases the ear despite what the dial says. Discovered this app and ten minutes later tuning nirvana and discovered one guitar needs a serious set up. Easy to use and so accurate. Best $10 spent ever. Just get it! Veteran band director and orchestral musician here. This is a great tuner. I find it very accurate and reliable. Put it up side-by-side next to my Peterson strobe tuner and they match perfectly. The $10 price is a bargain! HOWEVER, the app throws adds up over the app preventing you from using it once in a while. Why? I already paid for the app. Get rid of the adds, please. I use it to intonate my guitars. This app is the best tuner I’ve ever used! The strobe interface is what makes this tuner easier to use compared to my other ones. Yes, it is very accurate and sensitive just like how they claim. I was unsure about it because I didn’t have an interface, so I’m just using my phone’s onboard mic. Everything works with the built in mics, and you get the option on boosting the signal with some type of noise reduction option. The only downside for me is not being able to directly plug into the tuner, but that is just my own fault. I highly recommend this app! The best iPhone tuner app, by far. I use this app for setting the intonation on my guitars every time I do a setup. Its a very accurate tuner and very handy to have on my phone and tablet. Highly recommended. I also have a stroboscopic pedal which I've retired since I got this app. You always have your iPhone handy. Even when the moving bars are accurate the wrong note can show in the display, even when all other strings are muted. This usually happens on low E and I wonder if the phone's mic is not sensitive to low frequencies and a harmonic is being heard. Only other complaint also relates to low sensitivity of iPhone mic, in that electric guitars may not be loud enough to trigger the app unless played through an amplifier. Peterson sell an external mic for this but I figure if I have to carry a mic I might as well bring my pedal. All in all I use this app extensively. I have been using Patterson products for over 20 years and never let me down!!!! Fast, accurate response, easy to read and interpret. Love it. Much more stable / less jumpy / easier to use than other i-app tuners I've tried. Makes my guitar sound great. Worth every penny and more! This is an incredible tuner. I love my Stomp Classic, and this app brings the Peterson accuracy to my phone. It is one of my most used apps. 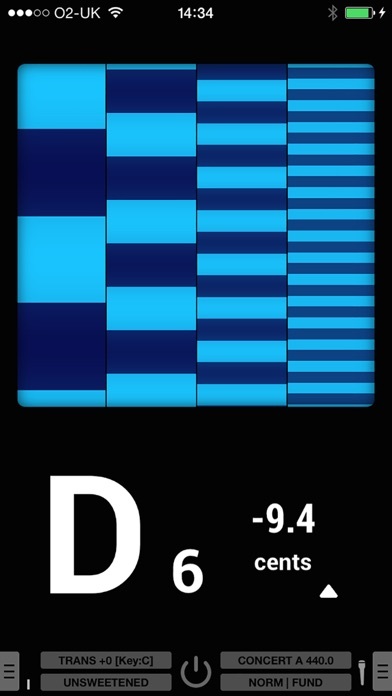 It's absolutely worth the money, even if it wasn't the only good chromatic tuner on the App Store. I can't imagine anything better. I purchased this tuner to help tune my pipe band (Scottish highland pipes). For an extra $10, you can buy the "World" sweetener pack that has a GHB (great highland bagpipe) setting. I can get me and my pipers so much better in tune using this than other bagpipe tuning apps, or even stand-alone tuning devices. The only nit is it takes a few too many clicks to adjust the Hz (as the pipes are constantly moving as you play), but that is too minor to take a star away from an otherwise excellent app. I've been using Peterson tuners for about 15 years. They are all excellent. This one is no different. Having a strobe accurate tuner in my pocket is phenomenal. Used to be the best. Pretty useless with my iphone 6s now. Hears total BS. Incorrect notes. Incorrect pitch. I would love to love this, but after buying all the in-app purchases I don't. 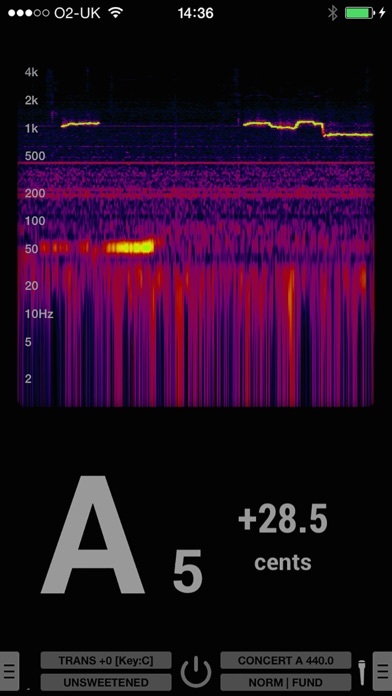 There are aspects of this tuner which are great, however as an iPhone app it is not perfect. In the studio environment it works well, but as soon as there is any ambient noise it gets confused and becomes unusable. I can't use it in any sort of live environment with the iPhone's internal mic. While the sweeteners are a neat idea I haven't found them to be particularly useful because I don't think they follow the intonation abnormalities uniformly. Whenever I use them my instrument is just out of tune, especially with other instruments that have all been "sweetened." From a tweakhead, let's-see-all-the-options-that-exist viewpoint, it's pretty neat. However, these options aren't particularly useful for just tuning my instrument quickly and PLAYING. I find that when I use it I am CONSTANTLY using it. I play a chord after it is tuned and it sounds AMAZING, incredible in fact. However after a few minutes it's out slightly and not in a good way. I find that I don't have this problem with other tuners. I open GuitarToolkit when I'm in stage, and I tune up quickly, and I don't have a problem later. This strobe tuner is very nuanced, and makes my guitar sound incredible for a short bit- but as for an average "sounds good" it doesn't seem to hold up. I really want to LOVE this tuner, and I do in certain (mainly studio) situations. However with all the options I spend too much time trying to figure out what is right for my needs at the time and I waste a lot of time and don't seem to end up with an instrument that is as playable. Possibly Peterson could add a "live" mode that gives a quick usable tuning for a live situation, is less affected by background noise. I think the tuner can already do it- but it is a lot of menus to jump through and things to think of when all I want to do is play an instrument that is in TUNE. I use it on acoustic guitar, electric bass, and mandolin. I do use it, and will continue to. I hope that Peterson either does some training videos on how to get the most out of the tuner, and uses real playing and gigging musicians -or- they tweak the interface to make it easier. As a note, you can't get to the options on an iPad in landscape orientation. You need to flip it into portrait. This is annoying because I use Logic Remote on my iPad on a mic stand in landscape, when I want to switch to the tuner and if I have to tweak any option I have to pop the iPod out of the stand. Anyhow, 3 stars. I hope to give it a 5 star in the future. 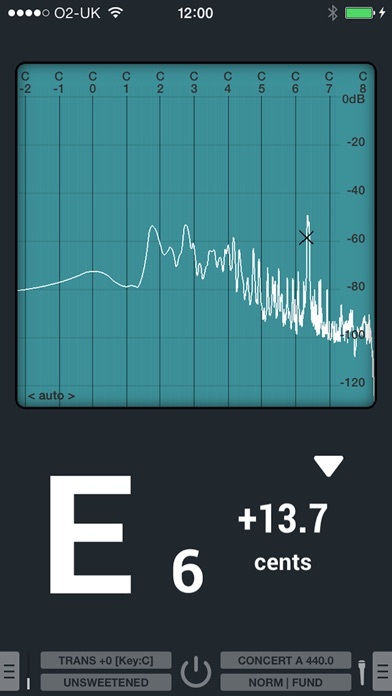 This tuning app is exactly what I've been looking for. I was looking for a tuner that could tune to exotic (eastern) temperaments and was about to drop $150+ on a hardware tuner then I found this. Displays cents and hz accurately so you can tune and/or set intonation on any instrument in whatever temperament you want once you do the math. I also brought the world 'sweetener' upgrade to set the frets on a sitar and it worked nicely. Highly recommend for tuning instruments outside of equal temperament. When used with a line-in adapter, you may need to close and restart the app. Otherwise, the mic stays on and the app can't get accurate input. This may have something to do with iPad going to sleep hole the app is in the foreground. A bit annoying since I do use this at work, and it requires repeated restart. Very pleased with the accuracy. I can really hear and feel the difference! The clip on feature is a great option for noisy situations. I can never go back to regular chromatic/needle tuners! Pretty much as good as it gets when it comes to iOS tuners. You will not be disappointed. This is the best easiest to visually pin point tuning app out there period. I would give it 5 stars but at times it does display wrong note your are running, just pluck again. 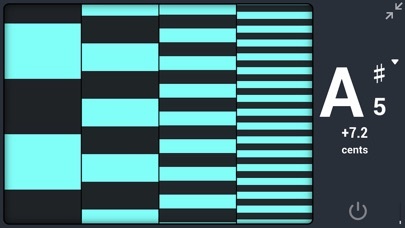 There are other "strobe tuners" in the App Store but none with the accuracy of this. Great purchase, you won't regret it. Have been a long time fan of the Peterson line of strobe tuning apps and of Peterson's "sweetened" tunings. 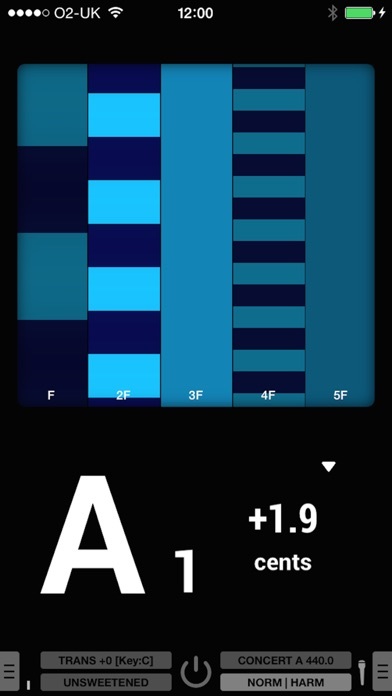 But must say that the I find the layout of the app to be my favorite above all of the other Peterson tuners. Aside from the very sharp and visible stroke display, I especially appreciate them listing how many cents your instrument is off from the desired tuning. Having the cents along with the strobe takes the iStrobo-Soft app over the top for me. Add to that the different tunings for almost every conceivable eclectic instrument makes iStrobo-Soft the one to get. This tuner is incredible. It has helped me set the intonation on all 5 of my guitars with a degree of accuracy I could have never imagined. And for $10. It’s a no brained. Buy the app, you won’t regret it. I recommend the guitar tuning sweetener as well. Finally, if you want this tuner to preform like it’s in a lab spring for the adapter cable. You can plug your guitar directly into the phone (gotta use that stupid dongle) and it will take all the extraneous noise out of the act of tuning your guitar. Along with the money spent on the app, the $13 for the adapter was money well spent. I don’t care how good your sense of pitch is, this app, especially with the the adapter, is simply better. I don't know what happened. Used to be good but after the last update doesn't even come close. My cheap on clip on tunes my guitar better! Wrong notes in display shows sharp or flat sometimes when the note is right on and no other notes are ringing. Wonderful tuner just as are all their products - in my experience. It might be perfect, if only they had included their sweetened tunings for Pedal Steel. Stunning! For years I used the fine "Tunelab" PC program to tune my piano, and a variety of small apps and sound sources to tune violins and violas. IStroboSoft is much easier to use and more accurate than just about anything other than Peterson's expensive hardware aimed at full-time piano tuners. This is my pick for the #1 app to add to your iPad or iPhone! I used to own a Peterson Virtual Strobe Tuner. This app is even better! I use it to setup the intonation on my electric guitars. Plus, I bought the sweetener pack for guitar. Very happy! I own an actual Peterson StroboFlip tuner, and I also love this app. Peterson is all I use to ensure tuning accuracy... All I want for Christmas is that you guys make this APPLE WATCH compatible!!! Pretty PLLEEAASSE??? 😉 Thank you! Being in tune is worth way more than $10. It is a steal, even at $10. This app is a successful implementation of Peterson's virtual strobe proprietary technology. The application compares very favorably with my original 490 and my StroboStomp 2. I am a professional musician and stringed instrument tech, and even though I can tune to within 5 cents by ear, this is an invaluable tool to constantly have in my pocket. To the reviewer that defiled the ratings out of ignorance because it's "IOS 11 only" - if you have a legacy device, as I do, the workaround is to buy the application through iTunes on a computer, then "get" from the App Store on your device. To the others who removed a star because it doesn't have a pitch pipe or metronome - where in the description does it claim these features? This is a tuner, and a damned good one. A used replacement for my StroboStomp would be $70. Many naysayers here probably have a $100+ Boss TU-2 on their pedal board (it is crap, has no pitch pipe or metronome, and employs LEDs to get guitarists vaguely close, yet nobody's whining to Roland) Sorry to bristle at ignorant reviewers, but they detract from the quality of this tool. Get it, and tune up already! Sorry for the three star review, I love this app, I have forever… But I can't get to my Buzz Feiten sweetener, with the new update it's too high off of the screen. I can see it there but it won't respond to a touch because there's only a sliver of it visible. [Rig: iPhone 4 / iOS 7.1.2] Excellent, accurate tuner.